Governor Andrew M. Cuomo announced that construction and installation of an over-height vehicle detection system at two interchanges on the Hutchinson River Parkway in the Hudson Valley have been completed. The purpose of the systems is to identify over-height commercial vehicles illegally entering Parkway ramps – an effort to improve safety on the Parkway. 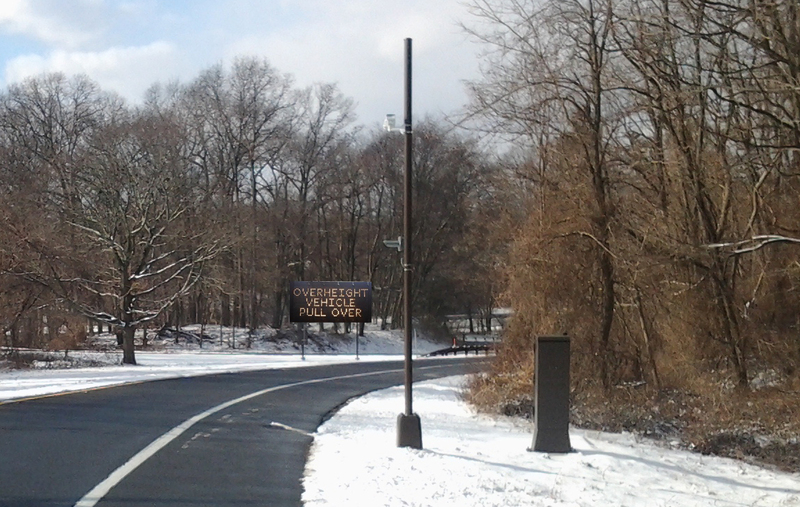 The detection systems were built at the Mamaroneck Avenue southbound ramp onto the Parkway and at the four ramps from I-287/Westchester Avenue onto the Parkway. The detection systems’ functionality is currently being tested. A photo of one of the detectors can be found here. The detection systems, developed by New York State Department of Transportation, are designed to prevent commercial trucks from entering the Parkway, where they could strike low bridges. This is the latest effort by DOT to keep commercial vehicles off parkways and improve roadway safety across the State. Bridge strikes often result in serious accidents, significant traffic delays for motorists and sometimes damage to the bridges. Governor Cuomo announced nine appointments to his administration, building his second term team to implement his bold agenda. Catherine Leahy Scott has been appointed Workers’ Compensation Fraud Inspector General, a position she will hold in addition to her role as Acting Welfare Inspector General and New York State Inspector General, to which she was recently reappointed. Vincent Bradley has been nominated to serve as Chairman of the New York State Liquor Authority. Mr. Bradley previously served as Assistant Attorney General in Charge at the Poughkeepsie Regional Office of the New York State Attorney General, managing all operations of the regional office. Jeffrey Pearlman has been appointed Chief of Staff and Counsel for Lieutenant Governor Kathy Hochul. Mr. Pearlman previously served as Chief of Staff to Senate Minority Leader Andrea Stewart-Cousins and the State Senate Democratic Conference. Mark Wade has been appointed Executive Director of the Worker’s Compensation Board. Mr. Wade currently serves as Deputy Superintendent of Property & Casualty Insurance at the New York State Department of Financial Services, a position he will be transitioning out of to assume his new role. Charles Fields has been appointed Deputy Secretary of State for Business and Licensing. Previously, Mr. Fields served as an Executive Strategy Consultant at Celgene Corporation, a publicly-traded biotechnology company focused on future technology and business capabilities. Robyn Adair has been appointed Special Counsel for Ethics, Risk and Compliance for the Department of Environmental Conservation. Ms. Adair previously served as Assistant Counsel in the Office of General Counsel for the New York State Department of Public Service, where she negotiated penalty settlements and drafted settlement agreements with public utilities and worked with agency staff to investigate natural gas incidents in New York. Justin Levin has been appointed Special Counsel for Ethics, Risk and Compliance for the Department of Health. Mr. Levin previously served as Assistant Special Counsel and, prior, FOIL Counsel to Governor Andrew Cuomo. Lindsey Boylan has been appointed Vice President of Business Development for Empire State Development. Ms. Boylan previously served as Vice President of Municipal Finance Client Strategy at RBC Capital Markets where she oversaw all brand promotion and client strategy for the company’s Municipal Finance Group. Saadia Chaudhry has been appointed Director of Customer Experience for the Executive Chamber. In this role, she will help drive a range of high-priority projects to improve customer service for citizens and businesses. To read the full statement from Governor Cuomo on the 2015-16 State Budget, please click here. Teacher Removal: For Ineffective teachers: Statewide, all hearings will be heard before a single officer rather than a panel. Local districts will be able to use new expedited removal proceedings for teachers with two consecutive Ineffective ratings, and will be required to do so for teachers with three consecutive Ineffective ratings. Failing Schools: Failing schools will be required to have a state-approved improvement plan in place with student achievement metrics and goals. If a failing school does not show demonstrable improvement at the end of one year, the school will go into receivership. During that year, either the Superintendent or the Chancellor will be vested with the increased powers of a receiver. The receiver will have the power to hire and fire staff and restructure the school and $75 million will be available to help failing schools improve. Public officials will be required to disclose all outside earned income they receive, from whom they receive it, the actual services performed to receive the income, and whether there is any connection to the state government or the office that they hold or their public duties. The Budget bars using campaign contributions for personal use. Such personal use will be defined as expenditures that are exclusively for personal benefit of the candidate or any other individual, not in connection with a political campaign or holding of a public office or party position. For further details on all highlights of the 2015-16 State Budget announced by Governor Cuomo, please click here. “I direct all agencies, departments, boards and commissions to immediately review all requests for state funded or state sponsored travel to the State of Indiana and to bar any such publicly funded travel that is not essential to the enforcement of state law or public health and safety. The ban on publicly funded travel shall take effect immediately. Governor Andrew M. Cuomo announced the opening of the new 93,500 square foot ice arena. The Cornerstone CFCU Arena is a $15 million dollar project designed to enhance the quality of life in the community by providing young people with easily accessible activities, while at the same time promoting physical fitness and developing good sportsmanship through supervised games. The arena is also an economic generator, expecting to attract more than 150,000 people each year for public skating, competitive hockey, skating lessons, private parties and performance training. These patrons could create a demand for more than 4,000 nights per year in area hotels. View the arena here. The state-of-the-art facility is located at the intersection of Chestnut and Market Street, just south of the historic Erie Canal that runs through the heart of downtown Lockport. The arena, designed by Bammel Architects, PC, houses two NHL-sized rinks, a community room and sports training facility for skaters of all ages. There is 2,000 square feet of tenant space for a restaurant as well as 630 seats for spectators, which are actually heated by the rink’s refrigeration equipment. The Cornerstone CFCU Arena is a federally designated 501(c)(3) not-for-profit corporation. Funding for the project came from a bank mortgage and a $1 million grant from the Western New York Regional Economic Council, $1 million from the John R. Oishei Foundation, and a donation of $4 million from the Grigg-Lewis Foundation. A portion of Chestnut Street on the South side of the arena was re-named “Grigg-Lewis Way” as part of the grand opening ceremonies. Duties for processing tenant rents were not adequately segregated and compensating controls were insufficient. Rent money was not adequately secured and was not always deposited in a timely manner and receipts for rent were not issued to apartment complex tenants. The board did not have a contractual agreement with the firm that performed financial services for the town prior to 2013, and contracts for 2013 and 2014 lacked specific details of the services to be provided. The supervisor did not appropriately monitor the firm’s work and did not adequately review monthly financial statements and reports before providing them to the board. The clerk did not always record, deposit, disburse and report all moneys collected in a timely and accurate manner. The clerk recorded cash received in the accounting system, but did not compare the collections to bank deposits. In addition, the clerk did not retain source documents to support property tax payments received and did not always issue duplicate receipts for tax collections. The town comptroller has not provided the board with complete and accurate monthly financial reports. Also, the town improperly budgeted and allocated sales tax revenue, resulting in town taxpayers with real property located in the village of Ballston Spa receiving an extra benefit from distributed sales tax revenues at the expense of town taxpayers with property located outside the village. Of the nine towns audited, six towns did not have adequate funding in 2014 for keeping their roads free of observable defects, and seven towns lacked the necessary records for auditors to determine if they implemented their plans or for the board to effectively monitor plan implementation. The New York State Board of Elections and local boards of election need to work collaboratively in the procurement of paper ballots to avoid millions of dollars in unnecessary costs. The ballot procurement processes used by the 13 Local Election Boards audited resulted in significant unnecessary costs. Auditors estimate that the local boards visited could have saved, in the aggregate, about $10 million during the audit period by competitively procuring ballots and by using sound historical data to project the numbers of ballots needed. CUNY SPS charged over $500,000 in advertising services to its state-issued procurement cards instead of contracting for these services, as SPS purchasing guidelines require. For fiscal years 2009 to 2011, SPS used a procurement card to purchase a total of $283,701 in printing services from one vendor instead of engaging in the competitive bids process for printing services in excess of $5,000, as state law requires. A state-issued travel card was used to purchase several meals from New York City restaurants for employees who were not on travel assignments as well as to pay for the office’s holiday parties. The travel card was also inappropriately used to pay for lodging and airfare totaling $6,546 for seven persons, five of whom were not SPS employees. DMV administers the Motor Vehicle Financial Security Act and the Motor Vehicle Safety Responsibility Act. These acts help ensure that the operators of motor vehicles driven in New York State possess adequate insurance coverage, or are financially secure, to compensate those persons they might injure or whose property they might damage as a result of an accident. Auditors found that for the fiscal years ended March 31, 2012 and March 31, 2013, net assessable expenses for the acts totaled about $20.3 million and $18.9 million, respectively, and that DMV is reporting its assessable expenses accurately. However, DMV lacks written policies and procedures for identifying which expenses are assessable. MTA’s travel policy directive does not clearly state all the requirements or procedures the staff need to take with regard to travel related transactions. This has caused the LIRR to incur higher than necessary travel expenses. Employees did not return unused cash advance monies within the time frame required by the LIRR Travel Policy. LIRR officials also did not perform any analysis for personal vehicle usage but do perform a cost benefit analysis when determining whether to purchase a new vehicle. The New York State Common Retirement Fund has committed an additional $30 million to Primary Venture Partners to invest in state-based companies, New York State Comptroller Thomas P. DiNapoli announced. The commitment will be made through the pension fund’s In-State Private Equity Investment Program, designed to make profitable investments in companies located in New York state. This is the state pension fund’s third commitment to Primary Venture Partners. Primary Venture Partners, formerly known as High Peaks Venture Partners, is an early stage venture capital firm. The pension fund made previous commitments to the firm in 2010 for $15 million and in 2003 for $27 million through the In-State Program. Primary Venture Partners has overseen the pension fund’s state-based investments in 42 companies including Vnomics, a fleet management software company located near Rochester and FieldLens, a construction industry mobile and web application developer located in New York City. The pension fund has invested $786 million in 298 companies and has supported nearly 4,000 jobs across the state through the In-State Program. To date, the program has returned a total of $293 million to the pension fund. There is $467 million available for new investments. Read about the pension fund’s In-State Private Equity Investment Program. As part of a coordinated law enforcement action, Attorney General Eric T. Schneiderman announced that his office and the Attorneys General of Oregon, Minnesota, Missouri and Texas filed lawsuits against Orbital Publishing Group, Inc. and a ring of interrelated New York and Oregon companies for mailing millions of unauthorized and allegedly misleading magazine and newspaper subscription notices to consumers nationwide. The solicitations were sent without the permission of the publishers and stated that consumers were receiving “one of the lowest available rates,” when, in fact, they were being charged, in some cases, more than double the publication price. The companies then pocketed the difference. Attorney General Schneiderman’s lawsuit, which charges violations of New York State law, alleges that, from at least 2010 to the present, the interrelated companies sent consumers unlawful solicitation notices designed to look like they came directly from at least 44 publications. The victimized publications include some of the nation’s leading periodicals, including Consumer Reports, National Geographic, the New York Times, the Wall Street Journal and the Washington Post. Attorney General Schneiderman’s lawsuit charges the companies violated Sections 349 and 350 of New York’s General Business Law, which prohibits deceptive business practices and false advertising, and Section 335-a of the General Business Law, which requires magazine renewal solicitations to disclose the month and year that the consumer’s subscription expires. The companies’ solicitations failed to provide this information. As a result, some consumers sent money to the companies to renew their subscriptions, not realizing that their current subscription had not yet expired. Other consumers complain that they sent payments to the companies but never received their subscriptions. Many of the consumers affected by the scam appear to be elderly. Attorney General Eric T. Schneiderman announced a settlement with the National Junior College Athletic Association (“NJCAA”), to eliminate an eligibility rule that limited the participation of students who attended fewer than three years of high school in the United States in their member colleges’ athletic programs. As part of the settlement, the NJCAA has agreed to eliminate the rule nationally, engage in outreach to junior colleges and students about the change, and submit any future eligibility rules concerning students’ national origin to the Attorney General for review. Report to the Attorney General complaints made by any member college, student, or prospective student in New York State, alleging discrimination on the basis of citizenship status or national origin. Speaker Carl Heastie and Assemblymember Crystal Peoples-Stokes, chair of the Government Operations Committee, announced vital Minority and Women-Owned Business Enterprise (MWBE) initiatives as part of the enacted 2015-16 State budget. The financial plan includes $1 million for the Minority and Women-Owned Business Development and Lending Program, which provides financial assistance to MWBEs, as well as to projects and programs that assist the development of entrepreneurship among minorities and women in New York. The budget extends the Minority and Women-Owned Business Enterprise program for an additional year and allows for the hiring of seven new full time employees to support the program. This important program has provided valuable opportunities for MWBE-certified businesses to access state contracting opportunities and technical assistance to secure them. The budget also extends the completion date of the MWBE Disparity Study by six months. The report will now be due by August 15, 2016. Assembly Speaker Carl Heastie and Health Committee Chair Richard Gottfried announced that the SFY 2015-16 Budget provides more than $86.1 million in funding for Medicaid initiatives and restores millions in funding to support community health programs that will ensure access to quality, affordable care and service for New Yorkers. In addition to providing capital assistance for hospital facilities, the enacted budget will continue to directly fund dozens of community health programs across the state and maintain prescription drug assistance to ensure that lower income New Yorkers can continue to afford the treatment they need. The final budget also restores funding to continue Medicaid support for elderly New Yorkers who require costly long term care, without jeopardizing the financial viability of their spouses. Funding for other Assembly priorities is also included in the budget, including $8.5 million for the Spinal Cord Injury Research Program, $3.9 million for Infertility Services and $3.3 million for the Enhancing the Quality of Adult Living (EQUAL) program, which supports adult care facilities to enhance the residents’ quality of care and life experience. Assembly Speaker Carl Heastie, Local Governments Committee Chair William Magnarelli and Economic Development, Commerce, Industry and Job Creation Committee Chair Robin Schimminger announced that $19.5 million in funding restorations for economic development funding is included in the approved 2015-16 SFY Budget. $600,000 each for Advanced Manufacturing in Central New York and the Seneca Army Depot. $200,000 for Canisius College Women’s Business Center and Center for Professional Development. The importance of New York grown food products to the state’s economy is recognized in the budget with language to expand the eligibility provisions of the Real Property Manufacturing Tax Credit to farmers. Inadvertently, farmers were excluded from this tax benefit that provides a tax credit equal to 20 percent of a manufacturer’s real property tax bill. Eligibility for this newly established tax credit, which was enacted in 2014, will now be extended to qualified taxpayers who are engaged in the production and manufacture of goods, processing, assembling, refining, mining, extracting, farming, agriculture, horticulture, floriculture, viticulture or commercial fishing. Assembly Speaker Carl Heastie, Transportation Committee Chair David Gantt and Corporations Authorities and Commissions Committee Chair James Brennan announced that the 2015-16 SFY Budget provides a $25 million increase in state aid to upstate transit systems, $50 million for the Consolidated Highway Improvement Program (CHIPs) and $250 million in additional funds for the Department of Transportation (DOT) road and bridge capital projects. Heastie, Gantt and Brenan noted that the Assembly pushed for a greater state commitment in transit aid to help the many financially struggling upstate transit systems that are in need of additional state support. As a result, the budget provides a total of $188.6 million for upstate transit operating aid, an increase of $10 million above both last year’s amount and the Executive Budget. It also provides additional and new capital funding of $15 million to help upstate transit operators invest in equipment and facilities that enhance the transit services they provide to the public. The upstate transit systems that will benefit from the Assembly’s advocacy for additional state aid include the Capital District Transportation Authority, Central New York Regional Transportation Authority, Niagara Frontier Transportation Authority, and Rochester-Genesee Regional Transportation Authority. Assembly Speaker Carl Heastie and Higher Education Committee Chair Deborah J. Glick announced the final 2015-16 state budget provides funding for key programs that will help make higher education more affordable and more attainable for New York students and their families. The enacted budget provides increases in funding for Opportunity Programs, enhances community college base aid and boosts outreach programs to put students on the Higher Education Road to Success. $9.98 million for Collegiate Science and Technology Entry Program (CSTEP). By raising community college base aid, the state reduces a financial burden for both students and municipalities. With this in mind, this year’s budget includes a base aid increase of $100 per full time equivalent (FTE) student at SUNY and CUNY community colleges, bringing the total base aid amount to $2,597 per FTE. In addition, the budget includes $2.5 million for CUNY’s Accelerated Study in Associate Programs (ASAP), which aims to help motivated community college students earn their degrees as quickly as possible. $7.5 million in funding for a new, New York AIMS Merit Scholarship program, which awards funds based on merit and need, is also provided. Assembly Speaker Carl Heastie announced that the 2015-2016 SFY Budget includes $200 million for the NYS Water Infrastructure Improvement Act of 2015 to assist municipalities in funding water quality infrastructure projects. The new grant program was initiated by the Assembly to address the financial crisis that many localities face when securing funding for waste water and drinking water infrastructure projects. The need to provide clean drinking water and sewage treatment results in significant challenges for municipalities that are unable to take on sufficient debt to fund the overall costs of the projects. Although local governments often have the option of applying for NY Environmental Facilities Corporation (EFC) loans, many do not take full advantage of this opportunity because they cannot afford to incur the amount of debt necessary to finance their clean water projects. The 2015-16 SFY Budget provides $200 million over three years for the NYS Water Infrastructure Improvement Act, and municipalities will work with EFC and the Department of Environmental Conservation to secure funding. The New York State Senate passed a $142 billion 2015-16 State Budget that reflects the Senate’s commitment to strengthening the economy, increasing education funding by $1.4 billion to $23.5 billion and substantially restoring Gap Elimination Adjustment (GEA) cuts, reducing the tax burden on New Yorkers, and creating a brighter future for communities across the state. For the fifth straight year, the 2015-16 State Budget keeps within a two-percent spending cap, rejects tax increases, and turns a $10 billion deficit into a surplus within those five years.